This last week was a bit dreary. I think it rained for nearly 2 days, seemingly nonstop. I don’t mind the rain, though, it can make me feel lazy. Pickle had Monday off from school. Now that I am done with school, I have been trying to play with him more. His imagination is different than mine. He makes up games using his imaginext characters. He loves those things. I do my best to play along, but I know I don’t always meet his imagination expectations (“no, mommy, do this or say that”). I really try not to genderize things, but he has a “typical boy” imagination: all things superhero and rough housing (yes girls can be that way, too). I, personally, do not have that same kind of mindset. I grew up dressing up barbies over and over again. I also was obsessed with dolls and playing house. Sometimes I am just not sure how to connect with him, using action figures. So what else holds his interest, that we can do together? I put together a list of the things we like to do, especially on those days where you can’t go outside. 1. Puzzles – Pickle has always enjoyed puzzles. We started out with the wooden ones that make noise. When you put the cow on the cow space, it moo’s. Now, we have moved up to any puzzle up to 100 pieces. Of course, he has a ton of super hero ones. He also has Peppa Pig and Blaze and The Monster Machines puzzles. I also have always loved puzzles, they’re relaxing for me. 2. Arts and Crafts – We tend to do a lot of art together. I pull out all the paint, crayons, and markers that we have. I actually have 2 crates full of art materials. You can create your own art or you can print off coloring pages from Google images that they can color. That is how I get my holiday coloring pages. Pickle, I think, is going to be some kind of body painter. He would much rather paint and color himself. 3. Legos – About a year ago, Pickle had started showing a real interest in building. We started out with megablocks. Last year, for Christmas, Santa brought him a large box of legos and a box of lego people. He also got a table with chairs that you can build legos on. He uses the table and legos all the time. He loves building things with Chris. Chris is like a master Lego builder. I, on the other hand, mostly just build houses or structures like houses. Regardless of our abilities, we enjoy building together. 4. Swim – in the bathtub – I don’t know about anyone else’s kids, but mine would live in the bathtub if we let them. They can play with bath toys, use bath markers/paints, play with fake shaving stuff, play in bubbles, and utilize their senses. We don’t go in there just to play very often, but it is something to do nonetheless. 5. Movie – Of course there are movies. We are currently watching Minions. You can even make popcorn and snacks or a picnic on the floor. 6. Dance/sing – One reason I am a fan of streaming music, is because radios are becoming like dinosaurs. You don’t have to worry about signal to hear music. You can also customize what you want to hear. I personally prefer Pandora. We use Pandora a lot around here. The kids love music and love to dance. I also love that it exerts their energy. Dance parties are a must with your kids. I also have a karaoke machine. Sometimes we like to bust that out and sing songs together. Though, you don’t have to have the machine to sing outloud. 7. Chores – Yes, chores can be a fun activity. Pickle LOVES doing the dishes in the sink. He could do that for hours. He also likes to help Windex the windows and doors. He will even swiffer sometimes. As long as he thinks it’s fun, who am I to stop him? 8. Cook/Bake – Another activity Pickle LOVES to help with is cooking and baking. He is always asking if he can help. I usually try to find something he can help with, if not all of it. Baking is usually a lot more fun for them because they get to put the ingredients together and watch it transform into something yummy. Stove top cooking, with little hands nearby, makes me nervous so I usually don’t let him help with that. 9. 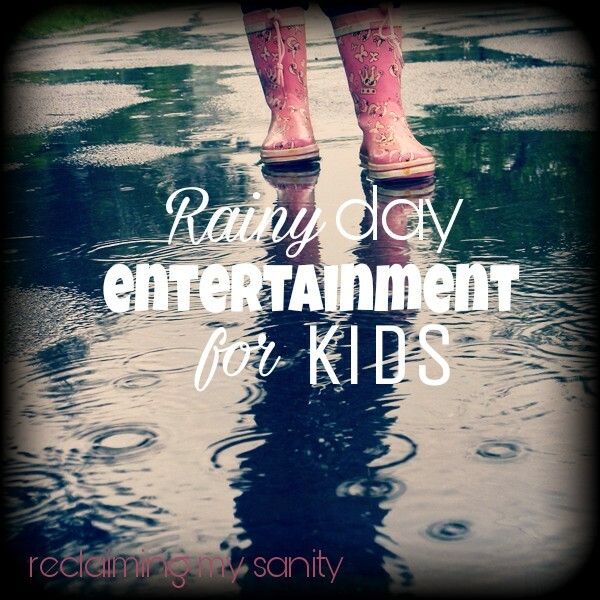 Playing – Sometimes it is just fun to play in the rain. Granted, it can cause people to catch a cold -so we don’t do it that often. Playing inside is also fun. We play this “game” where I hold Poppy and chase Pickle around like she is getting him. They both laugh so much when we play that. Pickle also makes up his own games to play. He does this thing now where he is an airplane pilot taking on bad guys and has to win. (I think he has been watching too much Top Gun, haha). 10. Bubbles – We have this fish bubble machine. I will put it up on the entertainment center and turn it on. Of course, Kona, is a bubble freak too so he usually takes over the party. All kids love bubbles, they get excited about it. The can run, jump, clap, pop them, dance, and just have fun. 11. Read – Pickle loves when we read him books. He has so many books! We recently purchased some from his scholastic book fair. I bought, Pete The Cat Loves His White Shoes, it is cute and entertaining. We also got some fall and Halloween books; There Was An Old Lady Who swallowed A Bat. I think reading to and with your kids is important. I never liked reading when I was young and I am convinced that that is why my comprehension was terrible. I want better for my kids. I don’t want them to struggle in the ways I did. I think keeping them interested in books will only benefit them (I don’t see any cons). 12. Board Games – For kids who are 4 and older, board games can be fun! The reason I say 4 and older is because, we have found, any younger than that they don’t tend to understand concepts in order to play the game. There are games like candy land, trouble, old maid, and go fish that they can play. Pickle likes playing Sorry, lately. There really is so much you can do, you just have to use your imagination. When that fails, I look to Pinterest. You can find all sorts of cool things there. Science experiments are fun, you can find a lot of those on there. It’s just a matter of utilizing your resources. 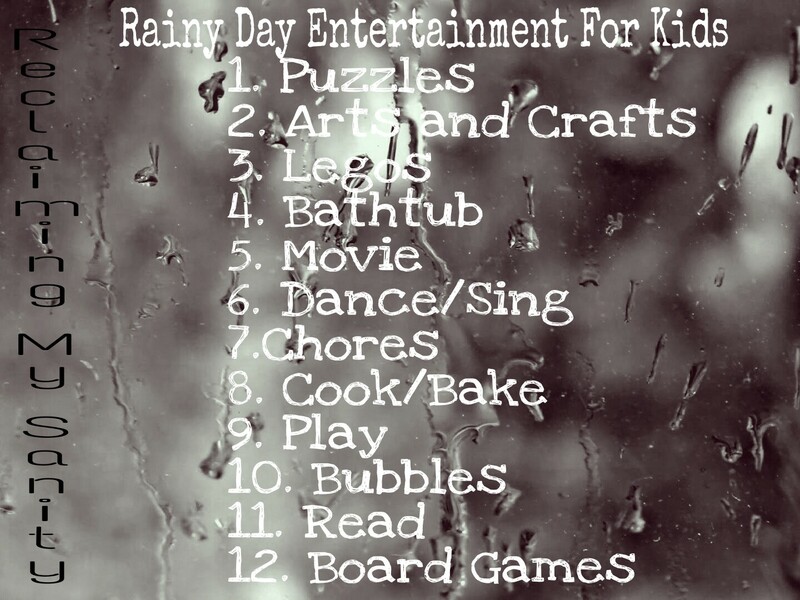 What kind of things do you do on a rainy day? Let me know in the comments.